Over the course of my career, I’ve been to a few conferences. Most were technical and most were related to the legal industry as that is where I spent the majority of my career so far. The last two years, I attended DrupalCon. Drupal is an open source platform for managing content and delivering websites. My business partner and husband Carson has been involved with Drupal for the last 6 or 7 years. Previously, I would travel to whatever city was hosting DrupalCon and would site-see while Carson participated in the sessions. Usually I would meet up with him at night for some of the social fun. Last year, we decided there would be value in me attending the conference to participate in the business summit, learn a bit about Drupal and maybe pick up a few project management tips. I did all of that and more. You can read about that experience here. But, what made me go back? When you run a small business, it’s really hard to take time away at conferences. Often, you still need to facilitate project work since you don’t have the luxury of a bigger team to pick up that work. Additionally, no work, no revenue. With all those considerations, we still both attended DrupalCon North America in Baltimore, MD. Why’d we do it? Proximity to DC and Opportunity to network with government contacts – While Baltimore isn’t our first choice for where I want to spend a week, it’s close enough that we didn’t really need to work for it. We drove up Sunday night and returned on Thursday evening. We also figured that the location would draw more government attendees. Since we live and work in the DC metropolitan are, we thought it would be a good networking opportunity. Global community – DrupalCon North America had more than 3,200 attendees from all over the world – Europe, Australia, India, South America. Willingness to tackle hard subjects – The Drupal community has been undergoing some serious scrutiny and challenging times as it relates to people’s choices and the perception & reality of that as it relates to an open source community. Many volunteers spent numerous hours coordinating community discussions, leading sessions and BOFs (birds of a feather) on diversity & inclusion and how to be an ally. The annual Women in Drupal event was the best one yet. We were glad to be sponsoring it again this year. The un-conference components – I can think of several parts of the conference that reduce the formality of the conference. Let’s start with the annual pre-note. This is fun, engaging sketch comedy formatted event that precedes the official keynote. It is usually comprised of drupal-themed songs, colorful costumes and a cast of characters. Then there are the BOFs, or birds of a feather sessions, are participate driven areas of interest to gather like (or unlike) minds to discuss. We can also include the unofficial “official” hallway track. I had numerous conversations with people this year about how they come less for the technical training and more about the community. Everywhere you looked you could see hugs, reunions and of course, the making of new friends. This year, one sponsor distributed flowers for the purpose of using it to thank someone who helped you. It was a little reminiscent of 8th grade or high school valentine’s day, but the sentiment was nice. Openness – Drupalcon always reminds me of the openness of the community. From the most basic example of vendors not being particularly elitist about who attends their large, very expensive parties to the level of details organizations are willing to share about how they run their companies and how they make decisions. 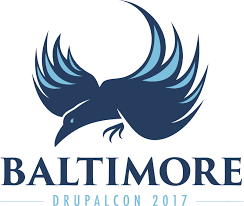 Thanks again to all the Drupalcon Baltimore volunteers and association organizers for putting on an amazing event. I’m heading to my first Drupalcon in New Orleans next week. While I’m a very technical project manager who has worked on website implementation projects with content management systems or other integrations, I’ve never worked in or on a Drupal project. This is really my husband’s area of expertise. Carson has been to several Drupalcons, but still spent quite a bit of time debating between the business and technical track. You can read his blog post on it if you’re interested in his thoughts. I struggled a bit with my own planning so I am hoping a blog post on it would help organize my own thoughts. I attended Drupal GovCon last year where I participated in mostly the business sessions. I wrote about that experience too. Going into this Drupalcon, I have many of the same goals that I had last summer: learn more about Drupal and make some good contacts in the Drupal community. As I was looking through the different sessions, I did not want to hyper-focus on any one particular track as I have personal & professional interests in business, project management, women in drupal and the learning more about the technical side of Drupal. I’m not sure this aligns to the typical attendee. This made my initial pass through the different sessions a bit frustrating. I walked away thinking that there wasn’t a lot of sessions that interested me and concerned that I would be wasting my time. I was a bit more successful the second time around, and by that time the Birds of Feather “BOF” (adhoc sessions) were available. Monday was easy! Carson participated in the business summit at last year’s Drupalcon and got a lot out of it. This year I’m participating in it, while he attends the government summit. This is a great opportunity to learn from other Drupal agencies. Businesses in the Drupal community tend to really open up their books and processes and experiences in a way that other businesses don’t. I attribute that to the core principles of giving back if you participate in the open source community. On Tuesday, I’m mixing up technical sessions with business ones. After my first Dries keynote, I start off my day with a session on understanding data structures and am definitely going to the session on how to get more involved in the open source community. Beyond that, I’m still bouncing between critical metrics for your business and teaching drupal to kids; case study on leveraging drupal to deliver business results beyond clicks, conversions & revenue and building a remote drupal shop. I’m also going to the BOF for small business owners to share ideas. Then we’ll head over to the Women in Drupal event we’re sponsoring. Wednesday is focused on the business side of things. I’m hoping the writing great case studies for drupal.org will allow me to pick up some skills for writing great case studies for anyone. Then I’ll be learning about selling the value of new drupal 8 technical features, and finding my purpose as a drupal agency. There is only one time slot where I have not decided yet. Is it the session on Drupal community as an example of diversity in tech or implementing performance metrics and dashboards for your digital agency or productive collaboration of sales and project management as a means to drive customer satisfaction? Before we head off for more socializing, I’ll participate in the account management to customer success evolution BOF. Thursday is the last day of sessions. I’m going to learn about successful drupal integrations then focus on growing talent & margins within your organization. I am excited to participate and think I came up with a good schedule. Lucky for me, I’m not locked into any one of these and can easily bounce between sessions as the floor plan & timing permits.